What will happen next is that the carpet baggers will move into the Levels to buy up the land at rock bottom fire-sale prices, which is all the farmers will be able to charge now that the land has been contaminated from overflowing sewerage and their farms are virtually uninsurable. The carpet baggers will probably make a killing in selling that land on to the frackers, as it stands over a huge shale gas field which they’ve been slavering over for some time. [Edit added 12 Feb 14: Greenpeace has confirmed that licences are being offered to frackers on land in the Somerset levels that is currently under deep flood water]. Chris Smith is trying to pretend that these cuts to dredging and maintaining banks and walls are all about austerity and cutting our cloth accordingly etc, like good little housewives. But it’s interesting to note that only £10 million is being set aside to bail out the Somerset Levels – (and it’s not new money; only the same £10 million that was cut) – while the big banks’ bail-out, just a few years ago, was to the tune of £850 billion. 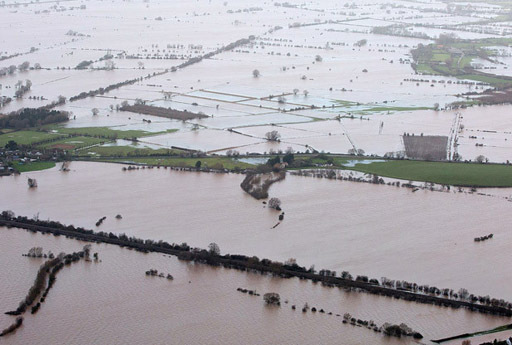 The original problem-reaction-solution impetus in the EU directive, which wants to turn floodplain, like the Somerset Levels, into “Washland”, seems to be based on a now outdated idea of the sea levels rising due to ice caps melting because of ‘global warming’. But ‘global warming’ has now had to resign itself to the findings of real science, and so has had a swift rebrand to ‘climate change’. However, ‘climate change’ is, in itself, a misnomer in that it indicates that a changing climate is a new problem which we have to deal with. In fact, our climate on Earth changes all the time…. the only constant in the climate on Earth is change…and just because the weather is behaving differently to how it has done during the course of our own allotted three-score-years-and-ten is hardly surprising. The climate on Earth is only a small part of huge cosmological cycles – even a 100 year cycle is as nothing, viewed from that perspective. We really have to stop beating ourselves up about this, and stop trying to control it. Added to that, the very notion of going back to an imagined time of pristine, untouched wilderness comes from a deluded Victorian fantasy about the Noble Savage which has somehow infected the more idealistic of the Greens. They seem to forget that man is a part of that very Nature that they want to protect. Geo-engineering is not a new-fangled or modern way of living on the land which is against Nature. For instance, when Tim Lohrentz did some research into the Ilopango volcano in 535 CE, he found that the Mayans had blasted through rocks with gunpowder to open up a river to prevent their settlements from flooding after that volcano erupted. Even the so-called pristine Amazonian rainforest, it turns out, was not a natural wilderness when the Spanish first arrived, but a huge geo-engineered market garden. In other words, man has long worked alongside Nature, and in a co-operative and sensitive way, to engineer it, to optimise its fruits. Geo-engineering doesn’t have to be about a war between man and Nature with one of them always wanting to run wild and roughshod over the other, as the UN Agenda 21 psychopaths want to do. Richard North has a lot of experience in environmental issues and is one of the few honest journalists left. He has just published this article which gives more details about how the trajectory was deliberately set nearly a decade ago for what he says is “Not so much a man-made disaster as a government-made disaster”. It is all very well for Chris Smith, Chairman of the Environment Agency, to prattle on about “difficult choices“, and to tell us that “more must be done to protect the Somerset Levels”. But the flooding crisis over which he is presiding is one which he, at the behest of the EU, has deliberately allowed to happen. Allowing the flooding of the Levels was a matter of EU policy, introduced by a 2007 Directive and consciously adopted by the Environment Agency in 2008, which then sought to increase the frequency of flooding in the area. What then makes it impossible for the people on the spot, like Owen Paterson, is that they are having to deal with those decisions, which were made years ago. Only now are the consequences becoming evident, while the people (or agencies) who contributed to the disaster are entirely invisible. In the “invisible” class is that classic elephant in the room, the European Union, which was behind the last great change in British strategy, heralded by a Defra consultation document in July 2004 called “Making Space for Water“. It introduced “a new Government strategy for flood and coastal erosion risk management in England”. The clue as to its provenance came on page 23, under the heading “European Dimension”, which told us that flood risk management was being discussed at the EU level, and the themes under discussion were “all consistent with this consultation and the current approach in England”. The outline of the EU approach had in fact been published in a COM final, (2004)472, the very same month as the Defra document, signalling the “European” interest and warning of further activity to come. At the time, Charles Clover, writing in the Telegraph, was very far from being impressed. He complained that, while Defra calls it “Making Space for Water”, others called it “flooding”. And, in those few words, the future government policy was revealed. Flood defence was to give way to “management”. In EU terms, that meant more flooding. Government consultation continued into 2005, making it very clear that a “new strategic direction” was involved, one which involved changing the emphasis from flood protection to allowing certain areas to flood. For Somerset, this had already been spelled out in an EU-funded conference in Warsaw in 2003, outlining the results of the Ecoflood projects at a cost of €350,000, finalised in 2005. Flood defence for farm land, along with high levels of subsidies, had been for many years an important element of Britain’s production-orientated agricultural policy, wrote the authors. Many floodplain areas benefited from publicly-funded flood defence and land drainage schemes which reduced crop damage and facilitated a change to more intensive farming systems. Recently, however, they continued, policy emphasis has been placed on environmental enhancement, on greater diversity of economic activity as a basis for sustainable rural livelihoods, and on public enjoyment of the countryside. Funds previously committed to support farm output are increasingly diverted to encourage land managers to deliver environmental benefits. In this context, we were told, there is reduced justification for high standards of flood defence for agriculture. Indeed, there may be substantial benefits if some floodplain land is returned to its previous unprotected, un-drained condition. Therein lay the death knell for the Somerset Levels, as a new term was to dominate policy: “Washland”. This was an area of the floodplain that was to be allowed to flood or was deliberately flooded by a watercourse for flood management purposes. Unacknowledged by either government, the media or even Chris Smith in his current diatribe, this policy was given legislative force, not by the Westminster parliament but by an EU directive 2007/60/EC of 23 October 2007 on the assessment and management of flood risks, the so-called “Floods Directive”. In recital 14, we saw spelled out the requirement that flood risk management plans should focus on prevention, protection and preparedness. But, “with a view to giving rivers more space, they should consider where possible the maintenance and/or restoration of floodplains, as well as measures to prevent and reduce damage to human health, the environment, cultural heritage and economic activity”. Implemented as the Flood Risk Regulations 2009, there, writ large, was Defra’s “Making Space for Water” policy. It was all that was needed, by way of legislative authority, for an already Green-dominated Environment Agency to abandon the Somerset Levels and to allow them to flood. To reinforce the change, Defra commissioned a research project costing £105,032, carried out by Nottingham University, which noted that “EU legislation is really driving change”. The authors promoted an “ecosystem approach”, an idea at the core of EU policy, driving the move away from traditional flood control into the “sustainability” camp. The shift in policy can be seen with brutal clarity on the Commission website which gives priority to the “environment”, citing a raft of EU measures, including the Water Framework Directive, the Habitats Directive, the Environmental Impact Assessment and the Strategic Environmental Assessment Directive. The Floods Directive is part of the package and this, we are sternly warned, has to be implemented by 2015. Just so that there should be no doubts as to where the policy thrust lay, DG Environment in 2011 issued a note, stressing that flood risk management “should work with nature, rather than against it”, building up the “green infrastructure” and thus offering a “triple-win” which included restoration (i.e., flooding) of the floodplain. We believe, the Agency said, that “it is appropriate to look again at the benefits derived from our work, particularly focusing more on the infrastructure and the environmental benefits, which previous studies have probably underestimated”. We have, they added, “international obligations to maintain and enhance the habitats and species in the Somerset Levels and Moors, and it is within this context that all decisions have to be made”. Of six policy options, the Agency thus adopted the sixth, to: “Take action to increase the frequency of flooding to deliver benefits locally or elsewhere, which may constitute an overall flood risk reduction”. This policy option, they said, “involves a strategic increase in flooding in allocated areas” (p.142). The Levels were to be allowed to flood, as a matter of deliberate policy. Thus, when the BBC reported that the government had been “slow to act”, it could not have been more wrong. Our true government, the EU, had been there years before, planning to make the disaster that has overtaken the people of that part of Somerset a routine occurrence. The flooding was not so much man-made as made by government. By the time Owen Peterson arrived to try to deal with the situation, he was years too late. Between the EU, the previous Labour government and the Environment Agency, the damage had already been done.